Dustcontrol AB presents the second edition of the article series. Dust in the air can be a major hazard to our respiratory system. Dust has also a major impact on reducing the productivity of an employee. It is therefore important to identify the causes of dust formation in our environment and to avoid these as much as possible. 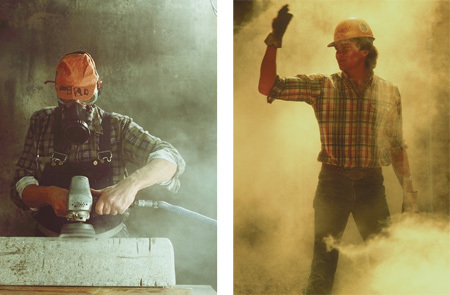 A workplace contaminated by dust reduces the productivity of the work force either through discomfort or through affecting the visibility. In many cases the dust is also hazardous. During the latest decades the demands on the quality of the air and the maximum allowed amounts of dust in work places have increased respectively decreased dramatically for the benefit of businesses and workers. Due to years of medical studies and research on the harmful effects of dust in the air, the legislations have been tightened considerably. To increase productivity in factories, new more efficient work methods were constantly developed. This development increased the deploy ability and efficiency of various working methods. The backside is that this is the root cause for higher dust exposure. The cause of the high dust load is due to drilling, cutting and sawing of asphalt and concrete. Additionally causes are due to handling of powdered materials, eg. plaster, cement etc. In one or the otherelder building asbestos is still to be found.Additionally especially in humid areas the risk of airborne mildew spores is very high. A proverb says “where you work, there chips fly”. In woodwork do not only chips fly, in addition a huge amount of wood dust is created. Wood dust – mainly hard wood – can also be carcinogenic (eg. oak, beech). It has been found out that welding fumes and grinding dust contain a large number of pollutants such as chromium, nickel, ozone, lead etc. These lead to a number of dust originated illnesses, since the amount of dust in the air frequently exceeds the allowed limits. Here you are exposed to the hazards of benzene and exhaust fumes from vehicles. But also exposure to dust from grinding and polishing can threaten your health. To summarize there are everywhere good reasons to keep the work places as dust free as possible through efficient source extraction and dust extraction systems.